Have you heard the rhythms? 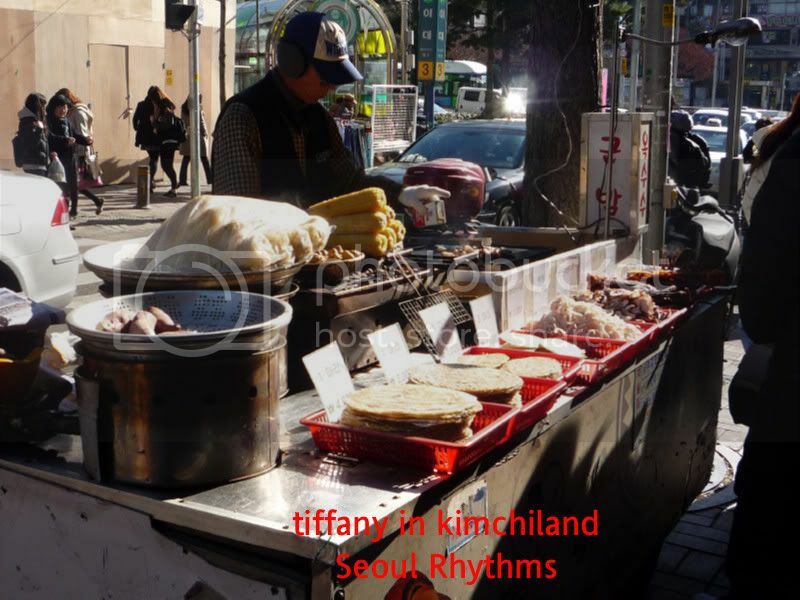 My new site, Seoul Rhythms is already up and running. There are still lots to do and tidy up but it's up and running. So, I wont be updating on this site anymore. 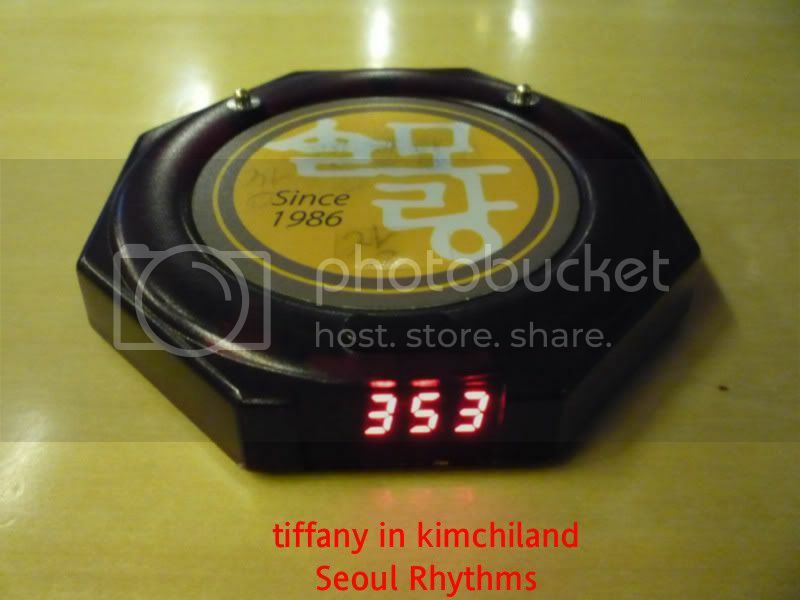 Seoul Rhythms will have alot more interesting things happenning, like shopping, tie-ups and giveaways. So I do hope you will visit that site just as often as you do here. I've posted about Super Junior's concert as well as Korean New Year over there. So do drop by. Are you having Secret Garden withdrawl? Want to listen to the beautiful songs in the drama again? Or drool over Hyun Bin and Ha Ji Won everyday? Or even relive the drama again in print? Well, you can get your fix here. 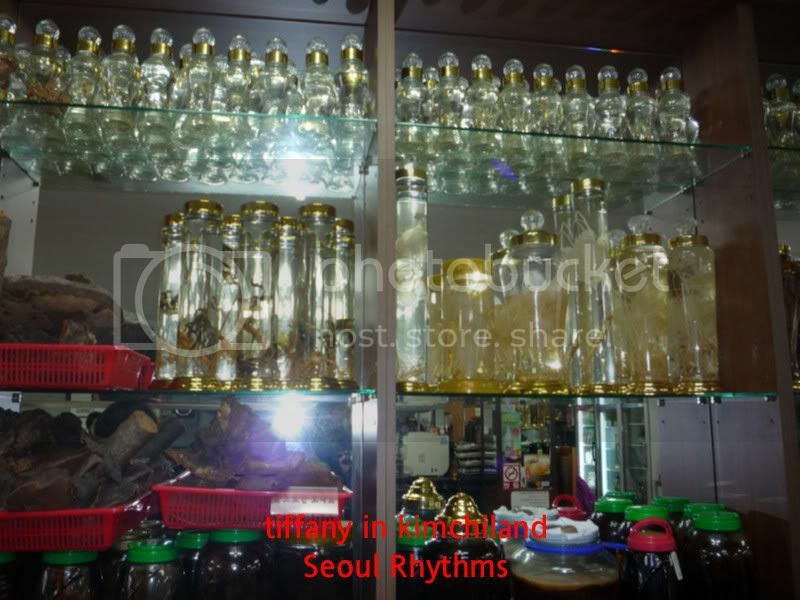 Seoul Rhythms is pleased to organise the very first drama related merchandise sale direct from Korea. 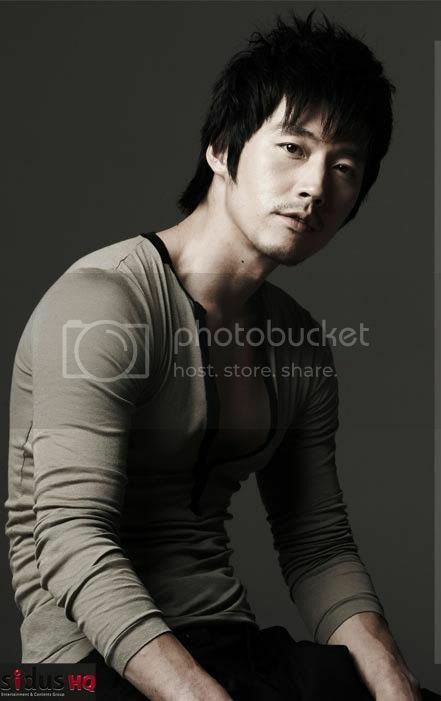 Finally finished my posting on Jang Hyuk's visit to Singapore. It's taken me longer than usual as I'm still trying to get used to wordpress on my new site. I thought it was supposed to be really easy to use but hor...I actually spent 2 nights trying to figure out how to resize photos, post youtube clips etc. Sigh.. The new site is not quite ready. But I'm working on it and I really hope to move very soon. (I thought wordpress was supposed to be easy...haiyoh) So do bookmark that site. Look out for exciting new developments there like shopping, giveaways and tie-ups. More will be announced very soon, really, very soon. So please mark that site ok? It was the last day of the trip but 3 of us (Sarah and Carolyn) had extended for a few more days, so we would be leaving only on Monday. Still, the days seemed to have passed very quickly. 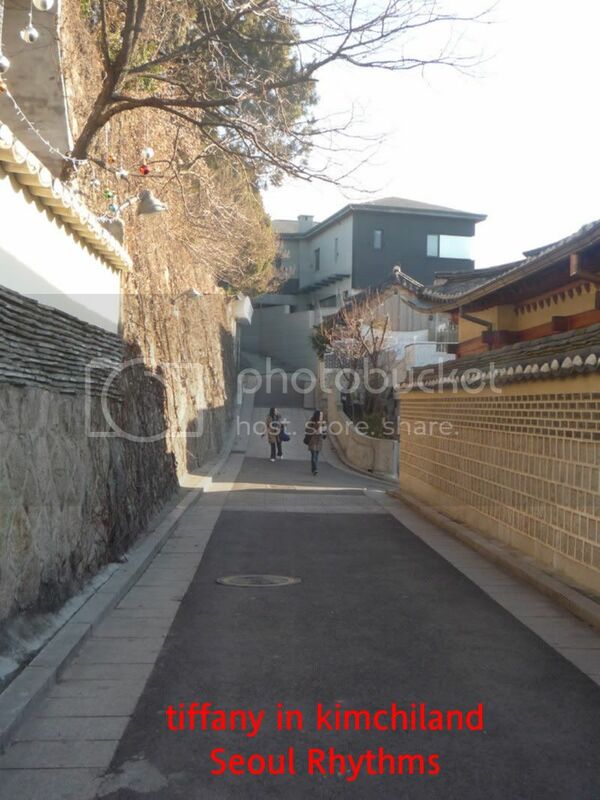 That morning, we visited Bukchon Hanok Village. 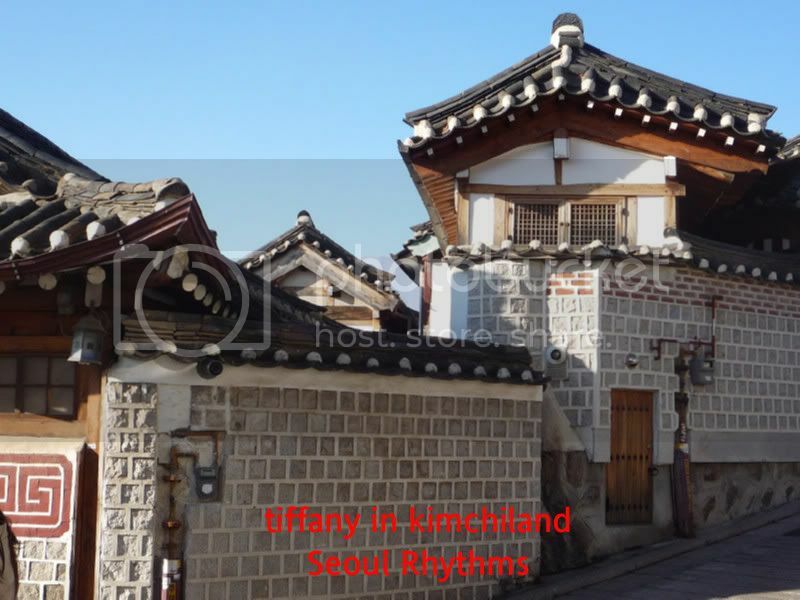 Hanok is the traditional Korean house and in Bukchon, the whole village has been preserved, much like some of the Siheyuan in China and shophouses in Singapore. 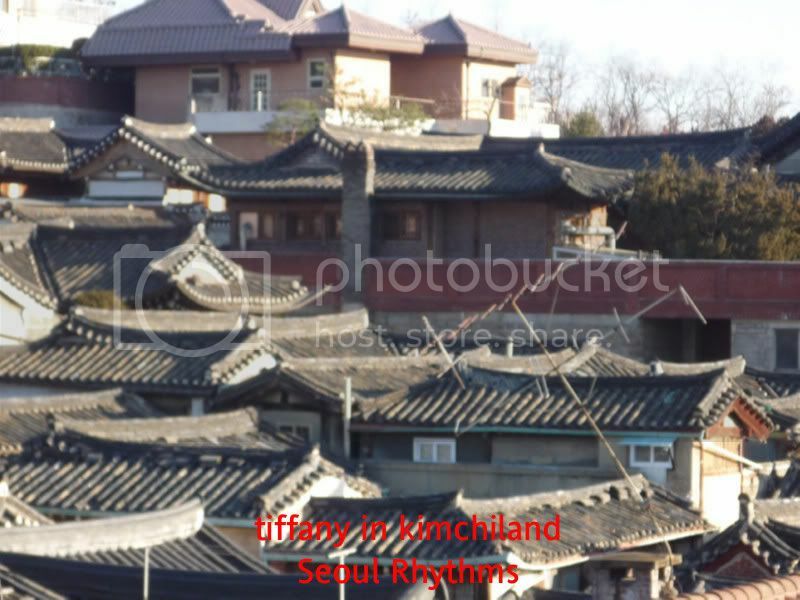 There are various Hanok villages in Korea but Bukchon was mainly for the aristocracy in the old days, hence the tiled roofs. Some of them are still living there whereas the some have been turned into cafes, shops etc. Even with the preservation, there are still changes in the village...modern mixing with the old. 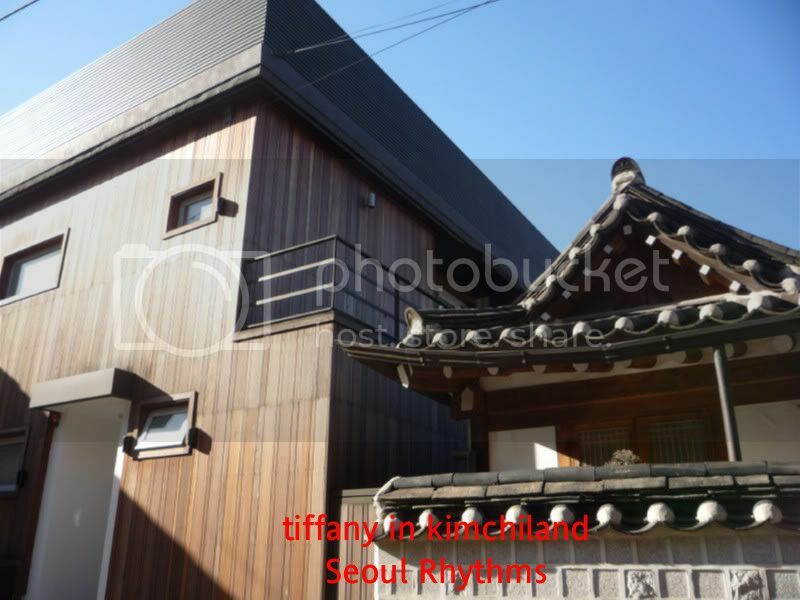 And guess what, Son Yeh Jin's house in 'Personal Taste' was filmed in Bukchon. 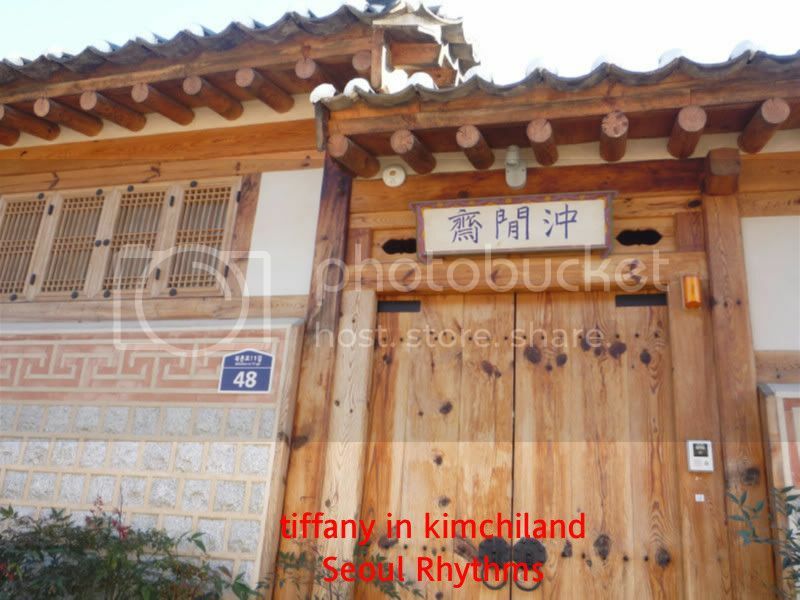 ^^ But no idea where though coz there are quite a few lanes and side roads within the village. It took us about an hour of walking about but if you really want to explore the place, make sure you wear comfortable shoes...it's uphill most times. 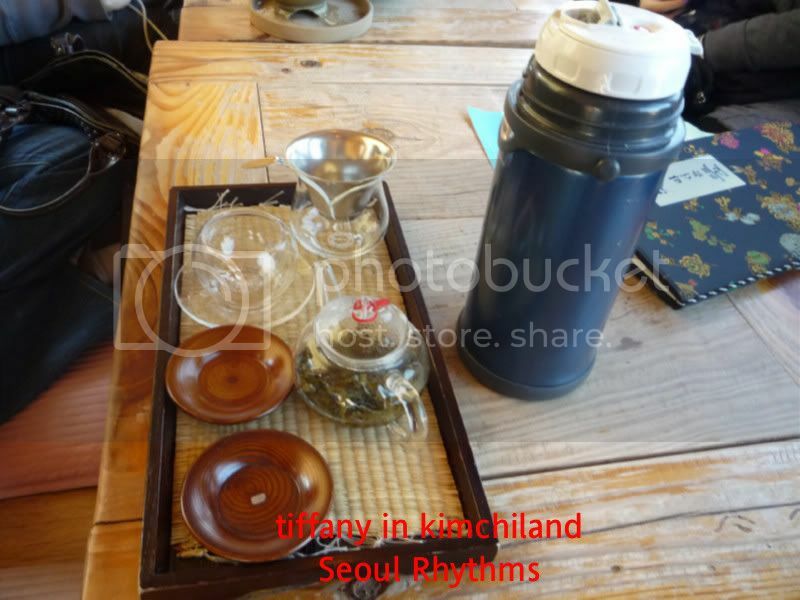 It was really cold and we were in need of a place to escape the cold....so we went to this tea house. Now, I've spent half a day trying to figure out the name (I forgot to take the name card), so if any of you can figure out the name, please let me know? Many thanks! It was very peaceful and calm inside the tea house. Great for refueling and or just having a morning chat with your friends. 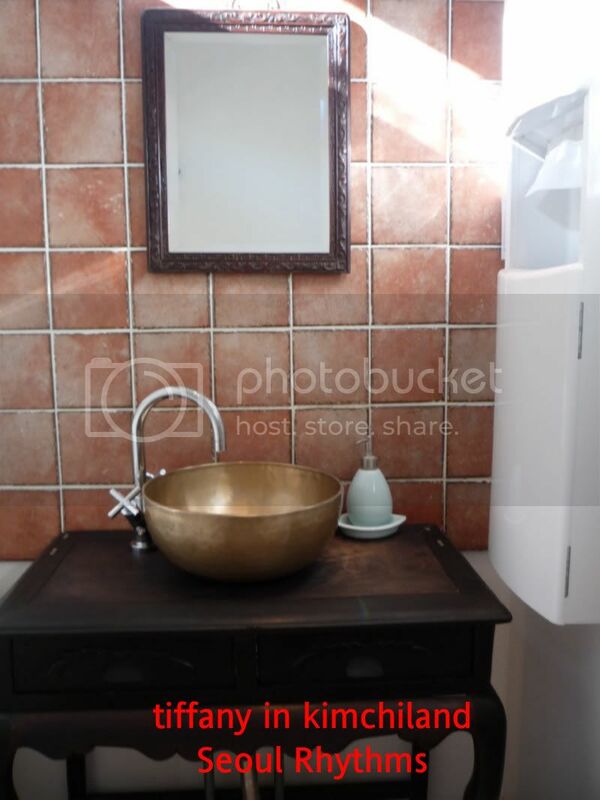 And I couldn't resist taking photos of the toilet whilst errr....sitting on the toilet bowl. Wahahaha! 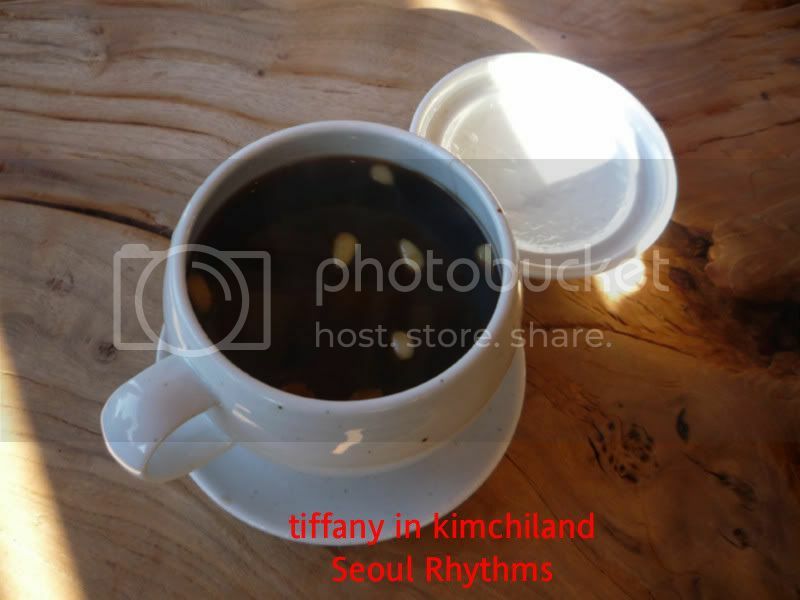 I don't have the exact address of the tea house, but I think it's near Bukchon-ro, 11-da gil. 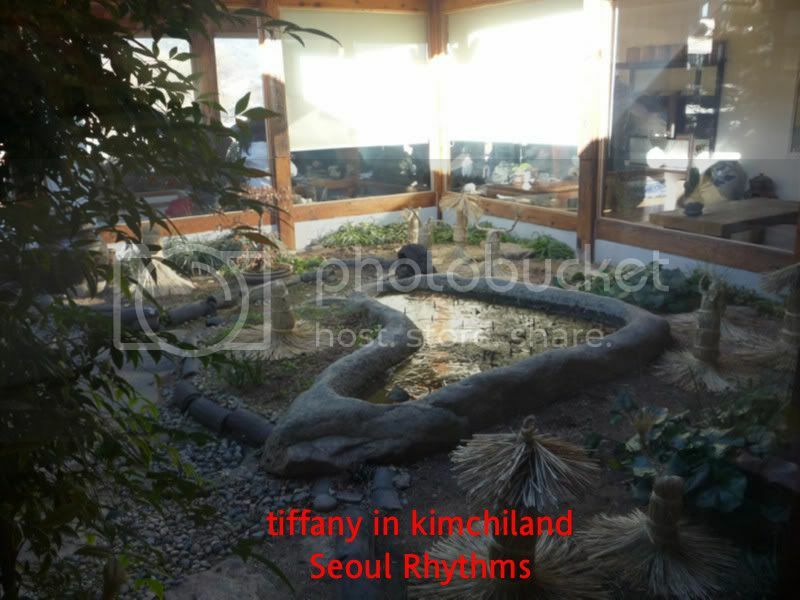 There are also Hanok Guest houses you can stay in for that authentic feel. 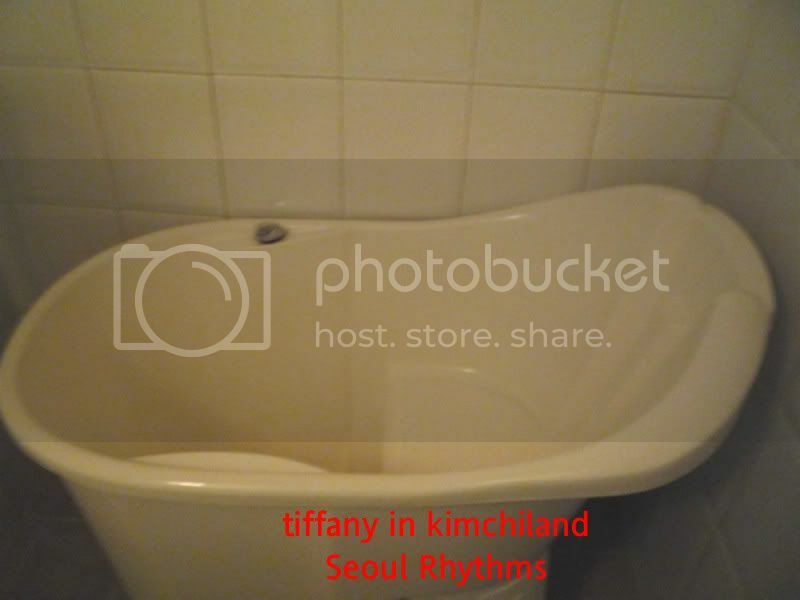 Check out KTO"s site for a list of places to stay in. To go Bukchon, alight at Anguk station, exit 3. And then, we were off. There wasn't much time to say goodbye to everyone It was the end of the official trip. It has been an incredible 5 days. I've seen alot of places that I normally wouldn't haven't visited. I've also found out new places. I only wish it wasn't so rushed and I had more time to explore the various places. But the guie, Julie has been great with all the anecdotes (too bad I couldn't remember all of them) and the staff from KTO has been wonderful in making everything so comfortable for us. The next couple of days, Carolyn and I would be on our own and we were all hyped out to do shopping and mroe shopping. Good thing it was summer or we would be seriously broke at the end of the trip. hehe! 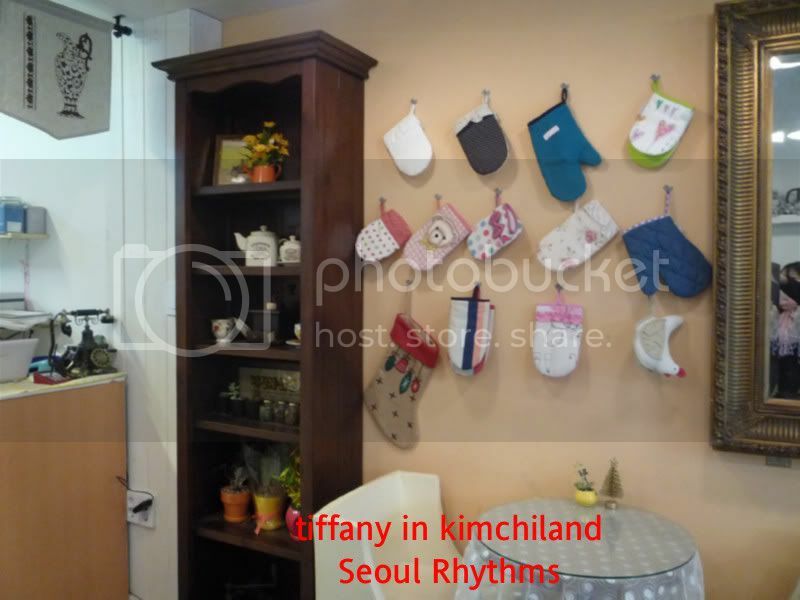 Anyway, Sarah went off to her friend's place and the rest of the group off to Myeongdong for a bit of last minute shopping before they board the plane. 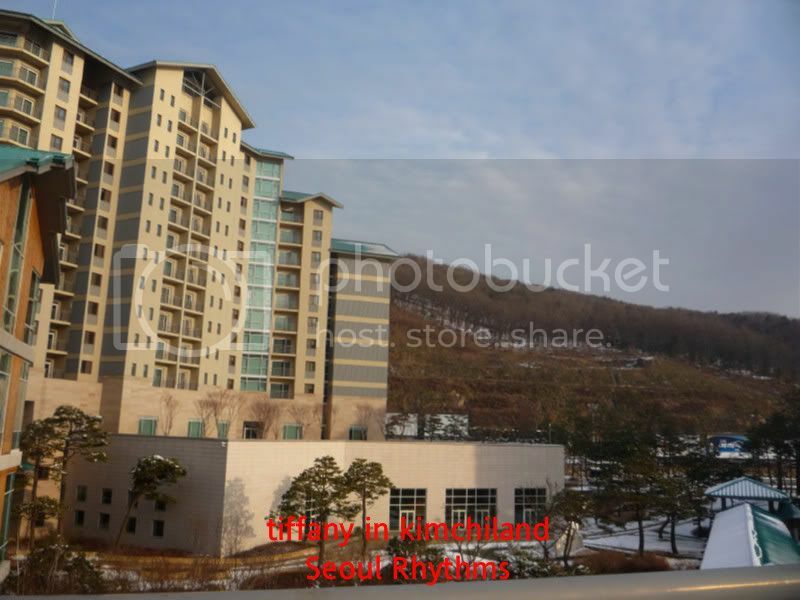 Carolyn and I went to our 'home' for the next 2 nights- Namsan Park Hotel. After the royal treatment the last few days, Namsan Park Hotel of course pales in comparison. 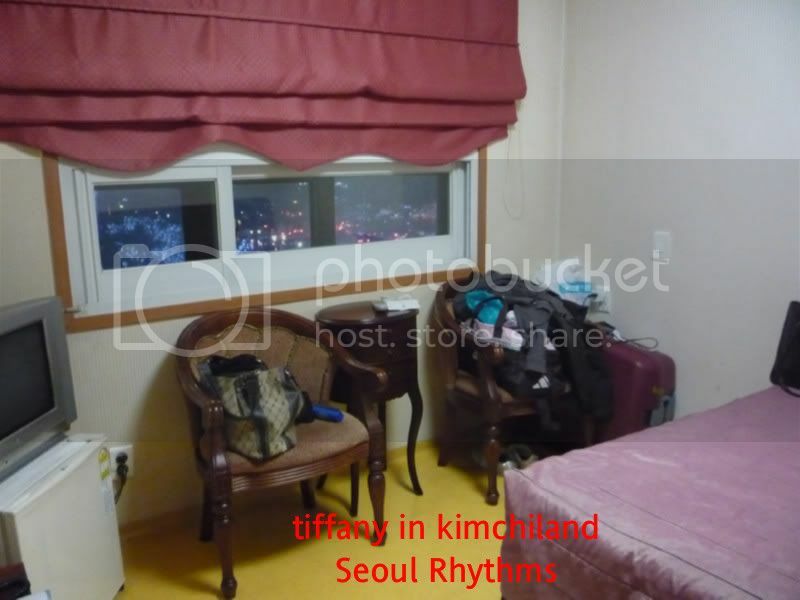 BUT, it is clean, the room is warm, it is at a very convenient location (minutes away from the train) and within walking distance to Myeongdong (about 15 minutes). Most important of all, it was very affordable- about S$70 per night. There were quite a few Japanese tourists staying there and the receptionist speaks a smattering of English, Chinese and Japanese. No meals included but there is a free water dispenser on each floor, plus TV, a small fridge and even a hair dryer! Not too bad for S$70 per night. Our room wasn't ready, so we decided to leave our lugguage there and go shopping. 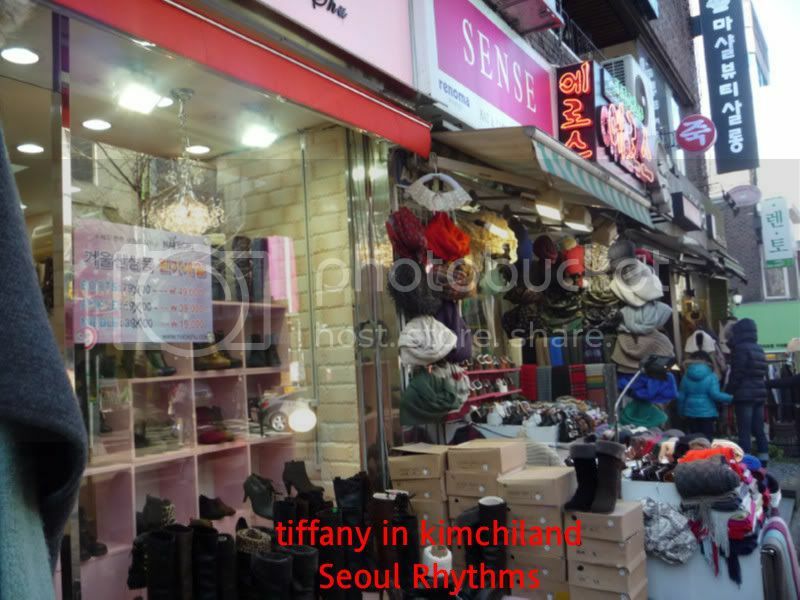 I suggested Sinchon or to be specific, the shopping area around Ewha Woman's University, one of my fav shopping area. To shop at this little gem, you must be prepared to explore the nooks and corners because the gems lie in the little lanes and back alleys. From shoes to accessories to clothes to bags, there is a wide range here and at affordable prices. The people patronising these shops are mainly students from the university..so they would be keen to buy a variety..to change frequently to be trendy but cannot afford the expensive range. I managed to buy a couple of cute ear-rings for 1,000won. Of course, there are the slightly higher end shops but by and large, most of the shops are mass prices. 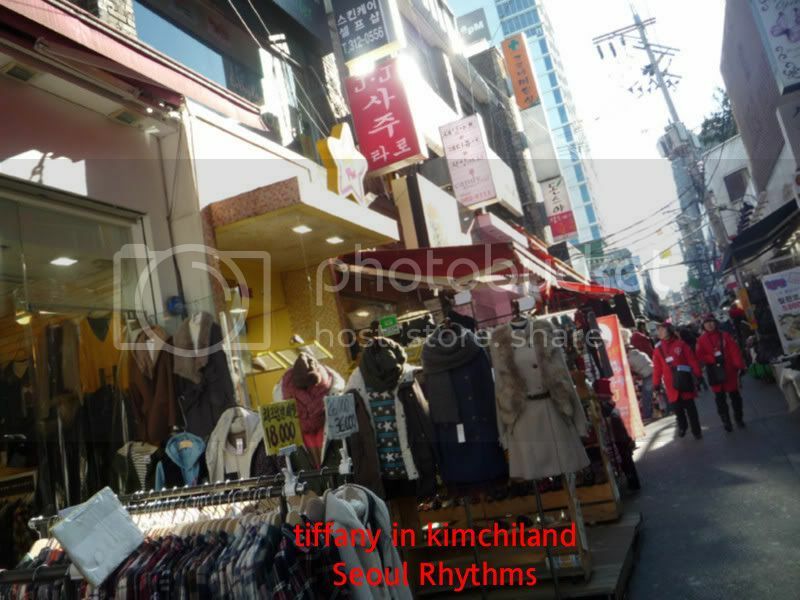 Besides the little individual shops, there are also your usual cosmetic chain like The Face Shop, Tony Moly, It's Skin etc. 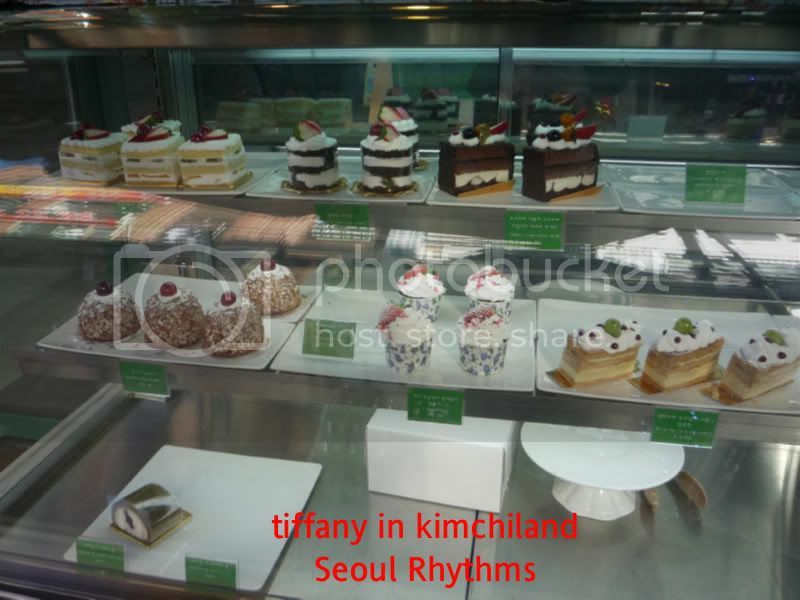 I find that the staff here tend to be less aggressive and more generous than those in Myeongdong (where it can get very competitive). 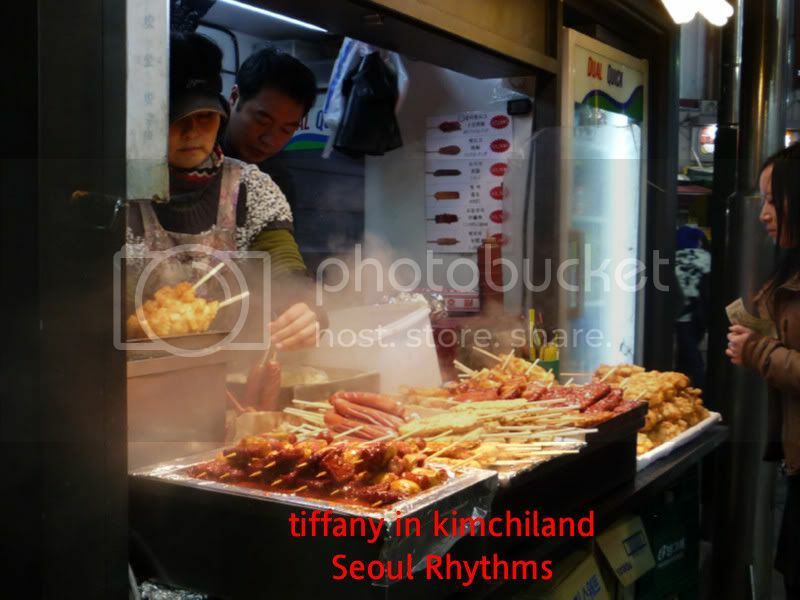 One of the pleasures of being in Korea is the street food. By then, we had enough walking and wanted to take a break. But we didn't feel much like eating (seriously, we were overfed the last few days) too much and then we saw this. How could we resist it's calling? Hehe! Cafe de Museum is one of the many small, cozy cafes there. Perfect for a girlfriends chatting session or a little holding-hands session with your BF/GF. 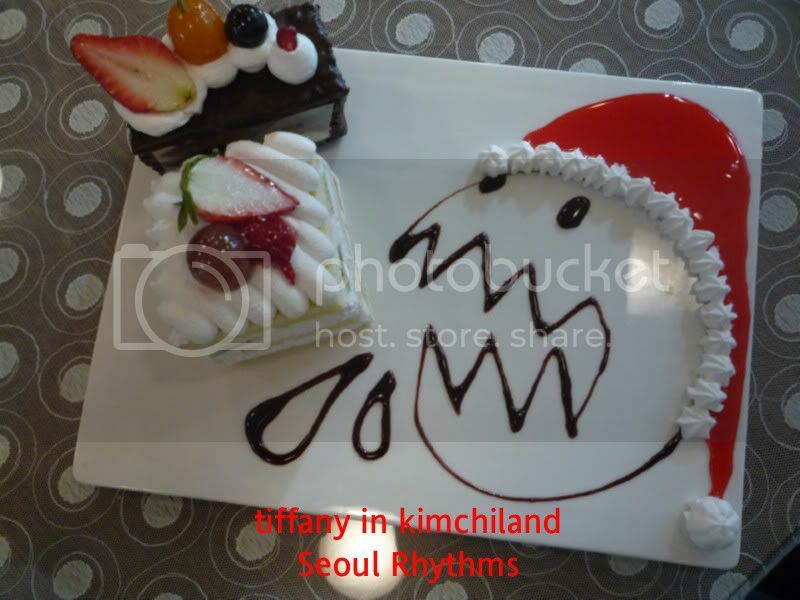 We both ordered a cake and a drink each and look what the staff did? Carolyn and I made our way back to the hotel in the evening for a much needed shower and to check into our room. I really liked the itinerary the last few days but I was also glad to have a chance to chill out and just do things at my own time. 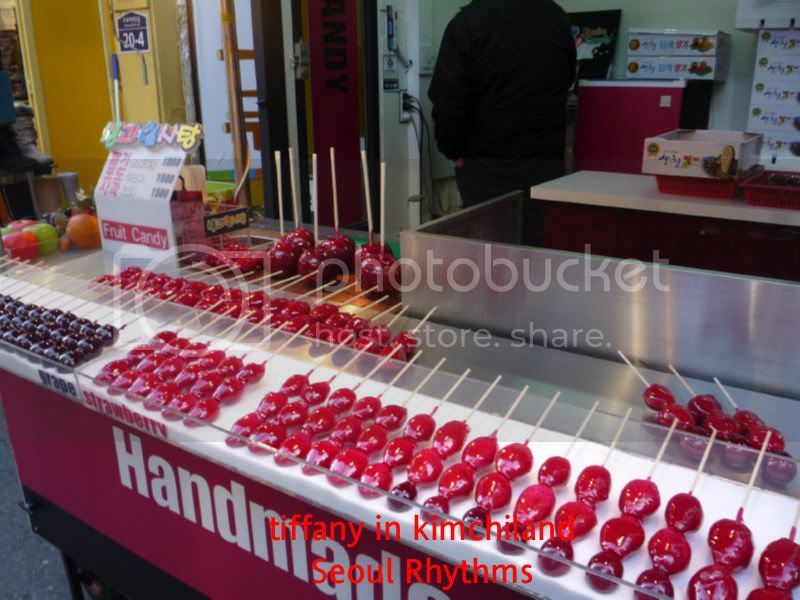 Later that night, wew decided to go down to Dongdaemun and leave Myeongdong for the next day. 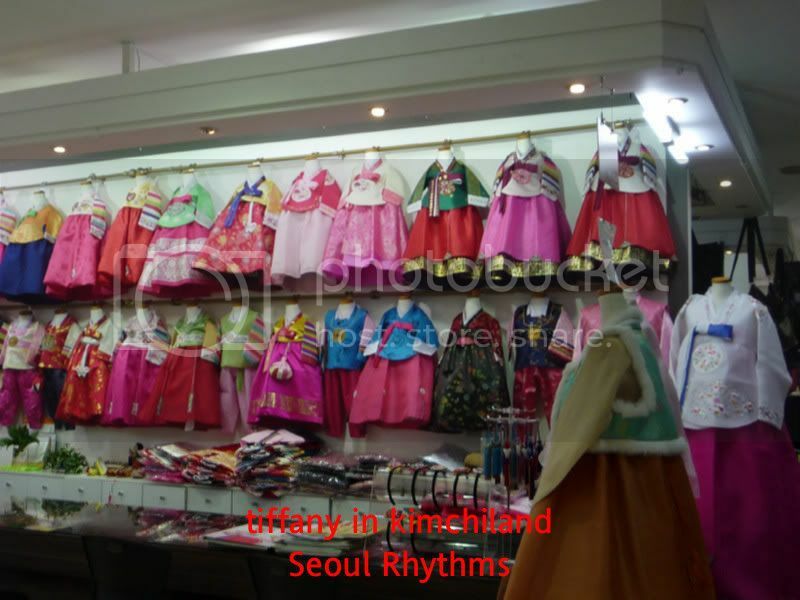 Dongdaemun is truely a shopper's paradise in terms of hours. It is open nearly the whole day up till the early morning hour. In factm the busiest time seems from 8pm to 2am. Shopping malls there include Doota, Migliore and Hello apM. Within the big malls are small individual stores, so prices can be very competitive. However, remember to bargain. You can usually get at least a small discount off. We had our dinner at the foodcourt at one of the mall. I wouldn't say the food is great but it did offer a decent place to sit down. This strange looking devise vibrates when your food is ready, so you don't have to stand around and wait. Neat huh? I think the foodcourts here in Singapore should adopt it. *Quirky note: Taxis become great in demand after midnight. Be prepare to fight for them. 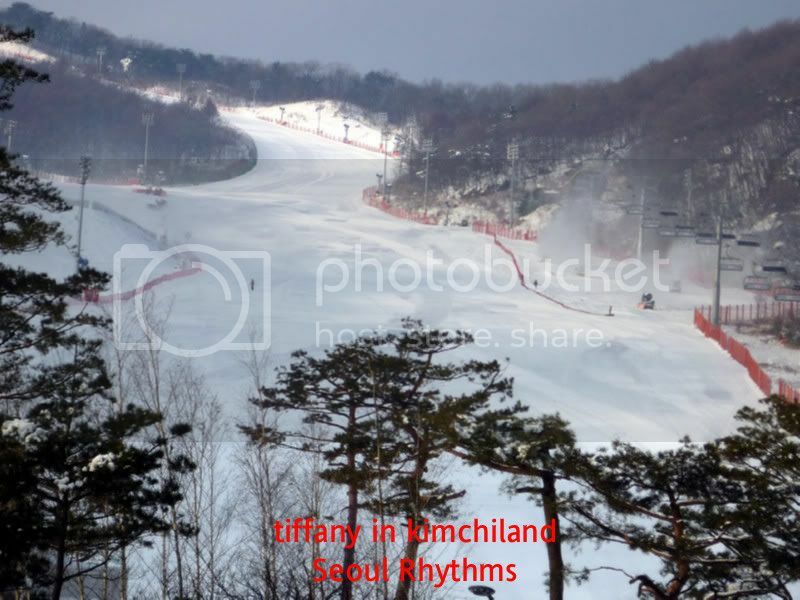 The night before, we had booked into a ski resort- Konjinam Resort. 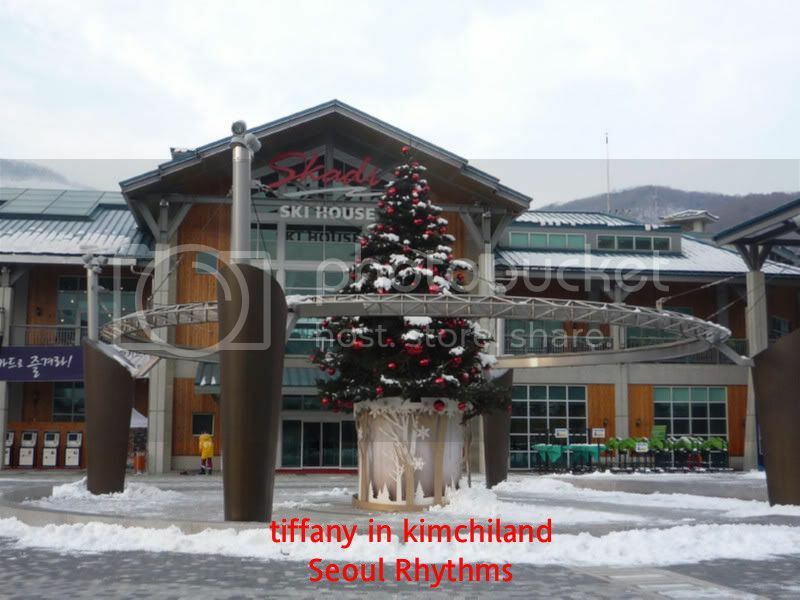 Opened in 2008, it is owned by one of the most well-known Korean company- LG. 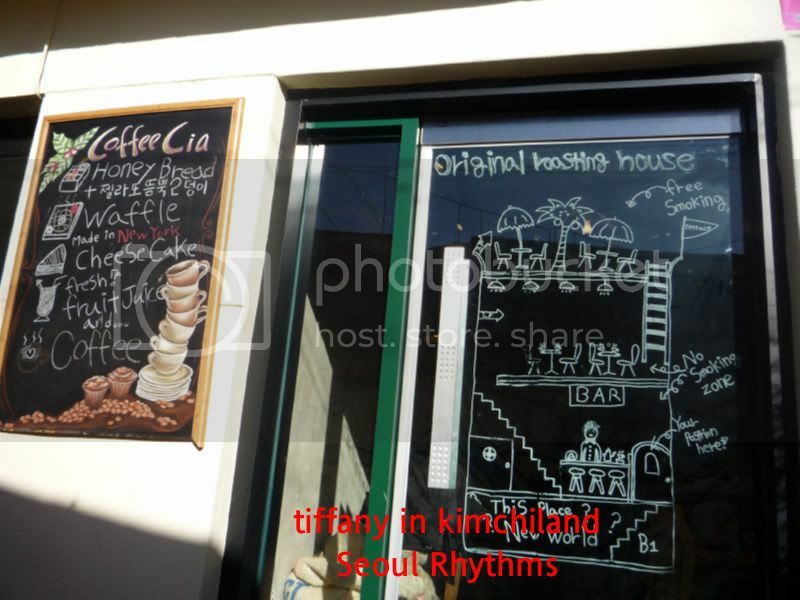 It is only 40 minutes away from Seoul, which makes it a great get-away option (especially if you are on a F&E tour). And yet, whilst I was there, it didn't feel crowded at all. In fact, there was a rather cozy feel about it. I've since found out that the resort imposes the maximum occupancy rule. What this means is that, there are no more than 7,000 skiers per day on the slop. No wonder it didn't have a 'busy' feel to it. What I liked about the resort was actually the landscaping...I love how it didn't just feel like a ski resort. You could be in a spa resort or a romantic resort... don't you agree? 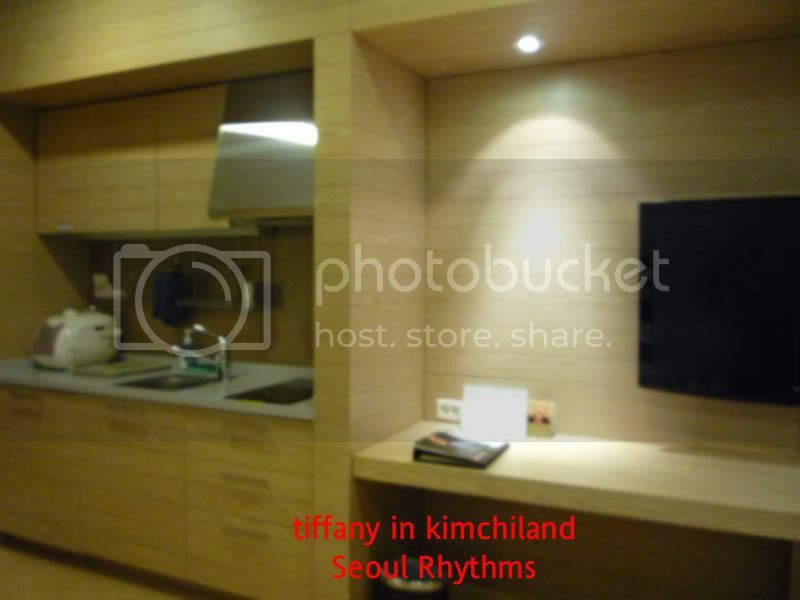 The room has a kitchenette and is spacious enough to accomodate 3-4 person quite easily without feeling cramped. The kitchenette is great for nights when you have had enough of trying out the over 90,000 bottles of wine and just want that cup of instant noodles (there is a convenienvce store within the resort- LG25). Hehe! *Quirky note: This resort does not provided bath towels. There are hand towels and if you ask for it, you can get bath towels BUT it is not part of the room amenities and you have to ask for it. Weird. That morning, a few of us decided not to go skiing and instead try out the spa at the resort. Spa la Spa has various various treatments and programmes to try. But if you are not keen, you can just take up the Family Spa package, which would allow you to use the indoor and outdoor pools. I must admit, I was absolutely bowled over with the outdoor pool. Why? 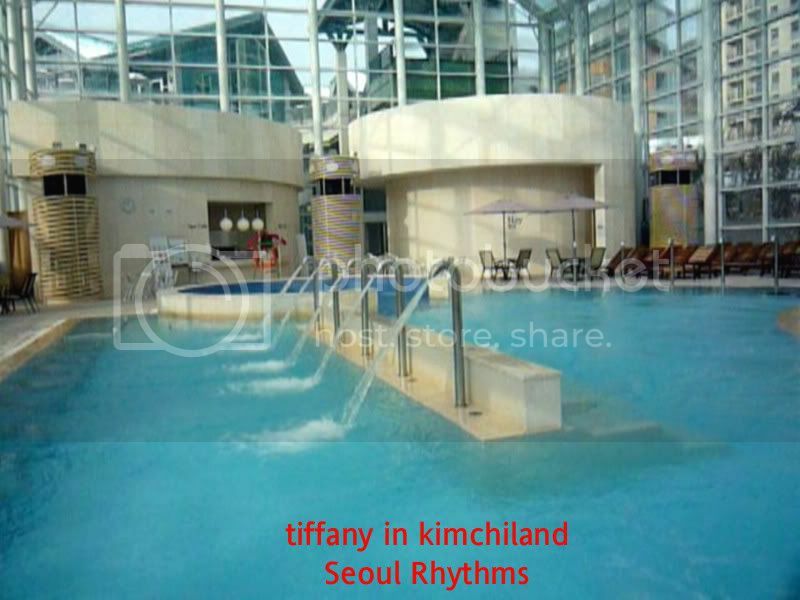 Can you imagine swimming outdoors in the middle of winter, amongst snowy mountains in the background? It ranks as one of the most memorable aspect during this whole trip for me. There is also a Sahara Room (with hot stones and twinkling lights for effect) and a Hay Room (it really, really was full of hay. I felt like a horse lying in there but must admit it smelt rather nice) next to the indoor pool. Great for relaxation. Would I go back again? Yes! It has such a nice feel plus the food was pretty good too. hehe! And then, it was off to lunch. 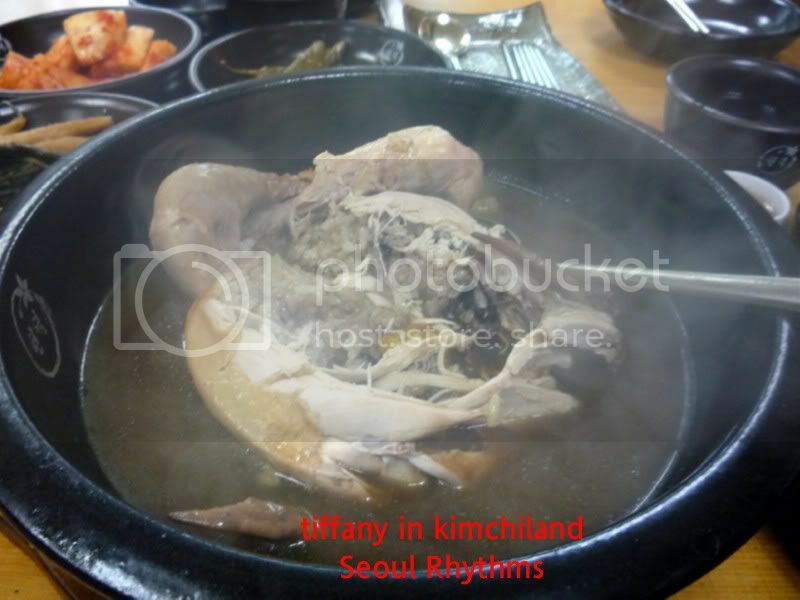 And we were going to try one of Korea's most well known delicacy- Ginseng chicken! Now, there are ginseng chicken and there are ginseng chicken. Some don't have the right taste, some- the chicken is not quite tender enough and some- well, you wonder where the ginseng is. 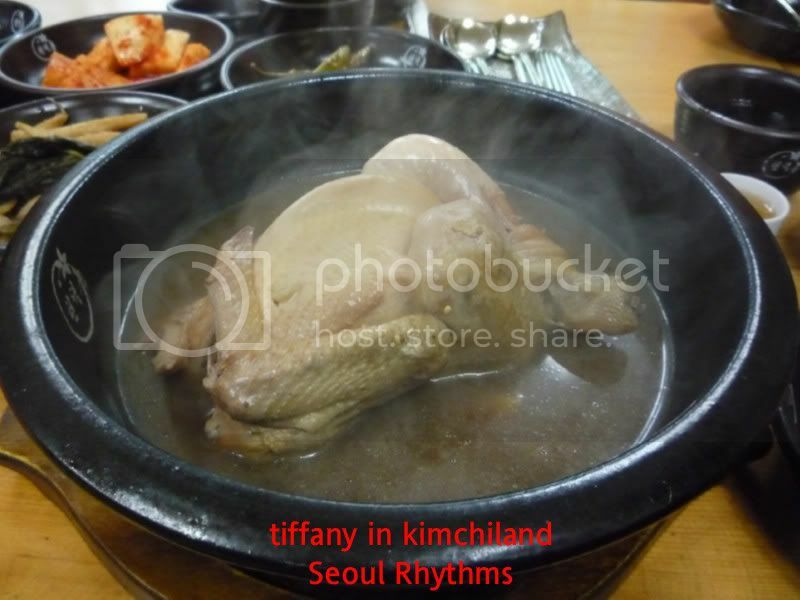 I'm very glad to say that the 삼계탕/ ginseng chicken we had passed with flying marks. 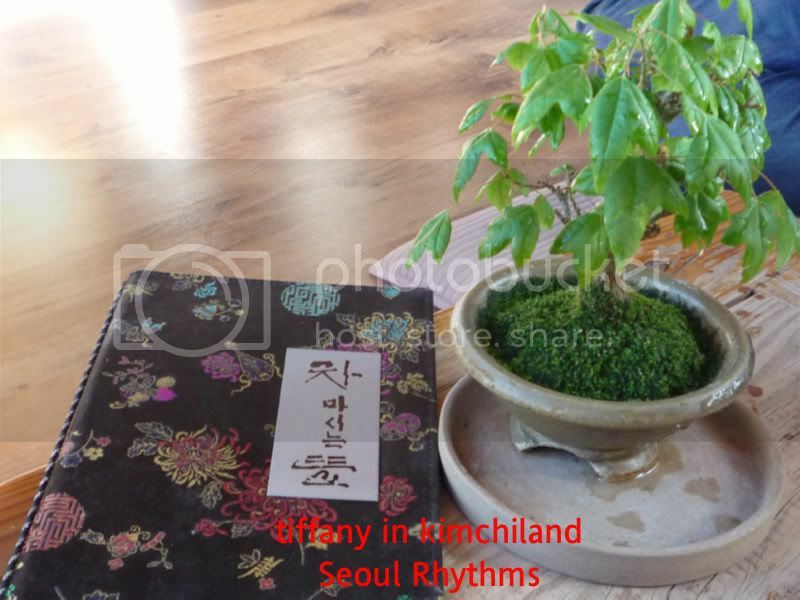 Korean ginseng can be cultivated or it can be wild. Obviously, wild ginseng is very rare, much superior in taste and medicinal value and of course, very expensive. ChonDoekBong Sansam Samgetang/ 천덕보 산삼 삼계탕 uses ginseng from the mountains (according to their namecard). Now, I have absolutely no idea if this means they are wild, or the shop itself plants them in the wild. 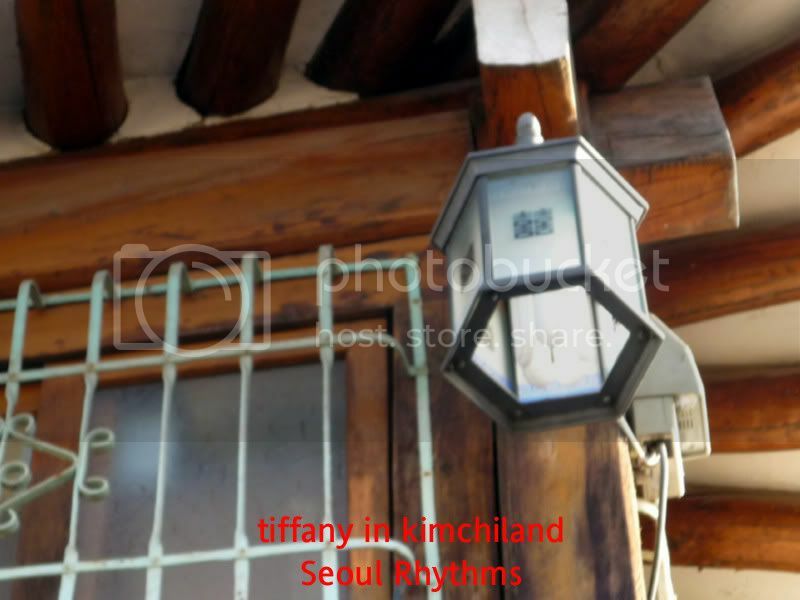 If you can read Korean well, then click on the hyperlink to their website. But no matter what, ths chicken was delicious! 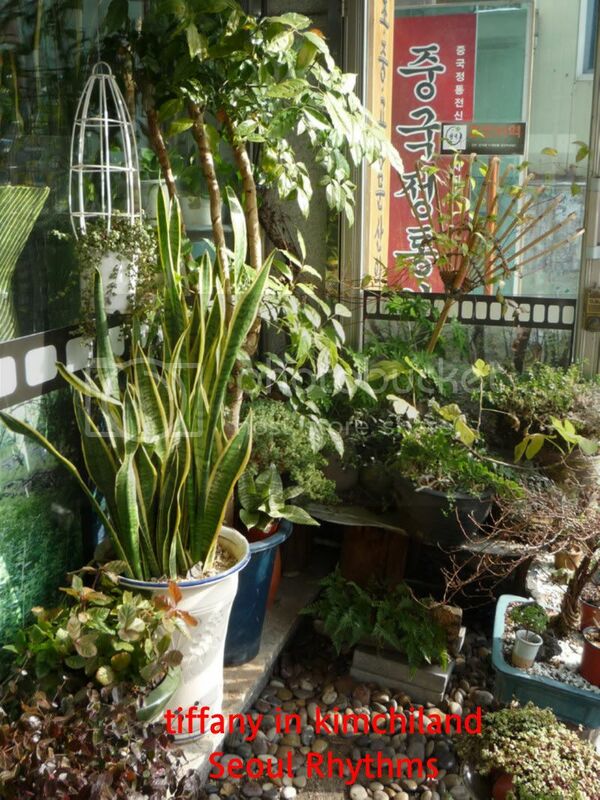 The very pretty 'garden' at the restaurant. *Quirky note: You are also offered a very small but potent ginseng wine. Drink at your own risk. 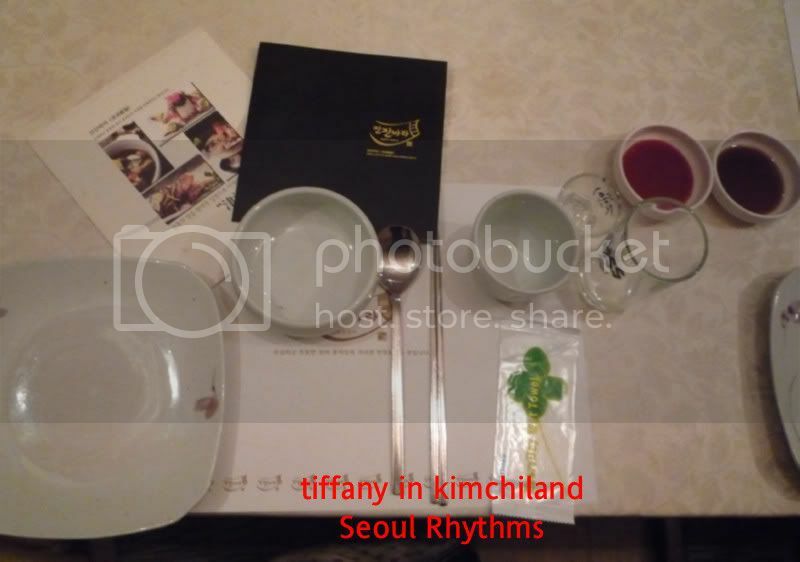 After this very full lunch, we headed back to Seoul for some skin care. 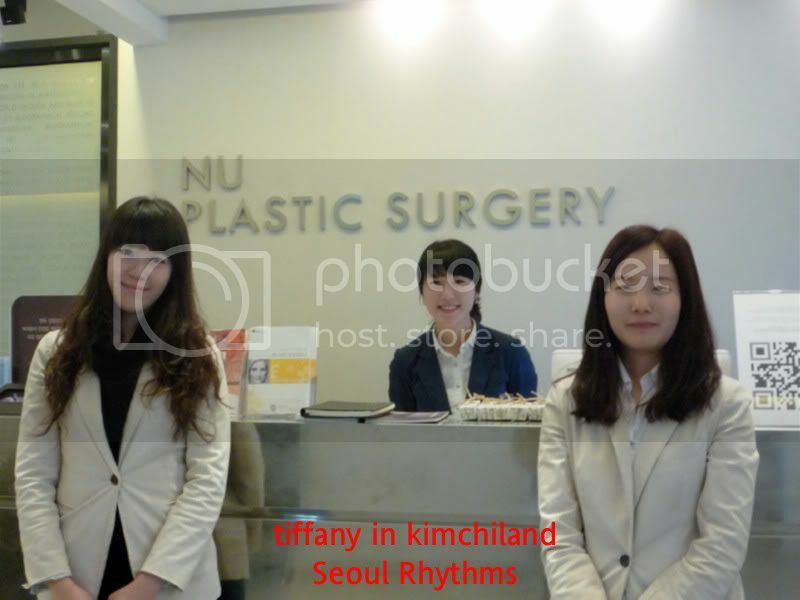 Nu Plastic Surgery is located at Chungdam-dong, Gangnam-gu (yeah, that very hip and cool area). Many people do associate cosmetic surgery with Korea (including me). With the advance of Hallyu, people began wondering...does every woman and man in Korea have large eyes, double eye-lids, high nose bridge etc? 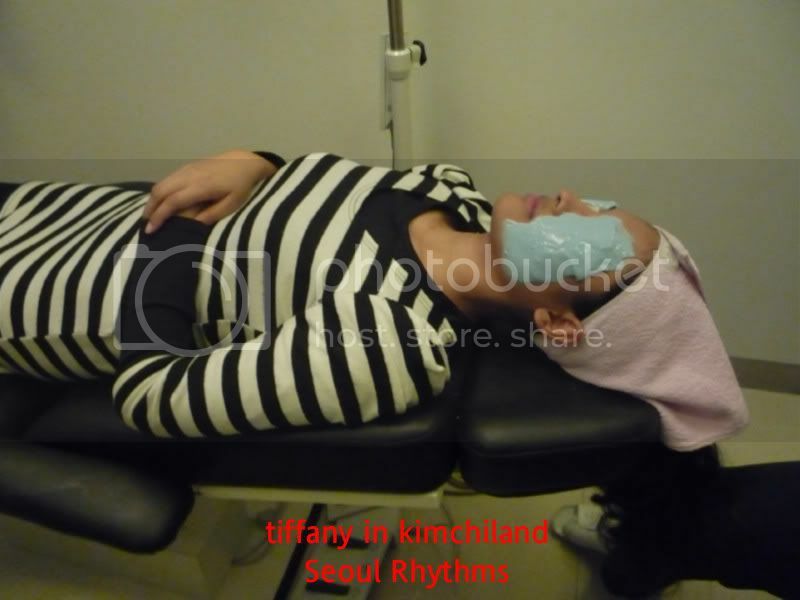 It is pretty much a fact that cosmetic surgery is no big deal in Korea. I think they see it as enhancing one's look and many of these surgeries can be done under an hour- just enough time during lunch for a quick perk-me-up. And there are no ends to the rumours about which artistes had gone under the knife. Anyway, back to the story. Cosmetic surgery is increasingly gaining popularity outside Korea and these Korean surgeons have managed to gain quite a reputation for themselves for quick, skillful work at affordable price. But with so many to choose from, how do you differenciate the quack from the professional? Well, I guess you can start with a list from Korea Tourism Organisation. It is not exhaustive and you can definitely shop around but it's a start. Nu Plastic Surgery is listed in there. Of course, we couldn't try any of the cosmtic surgeries offered (I would have loved to try the lipo suction. ^^) but we did get to try their facial and we were all offered free botox! Seriously! But only one person in our group and the guide tried it. Hmmm.. I must write and see how's the effect like. Me? I very kiasee...I didn't want to go home looking too different. hahahaha! Btw, if you are aiming to do a nose job (like my friend), be prepare to spend about a week there as they need to do a follow-up. But the whole procedure itself should take no more than 3 hours (I think). Good luck to those who are going to try it out. 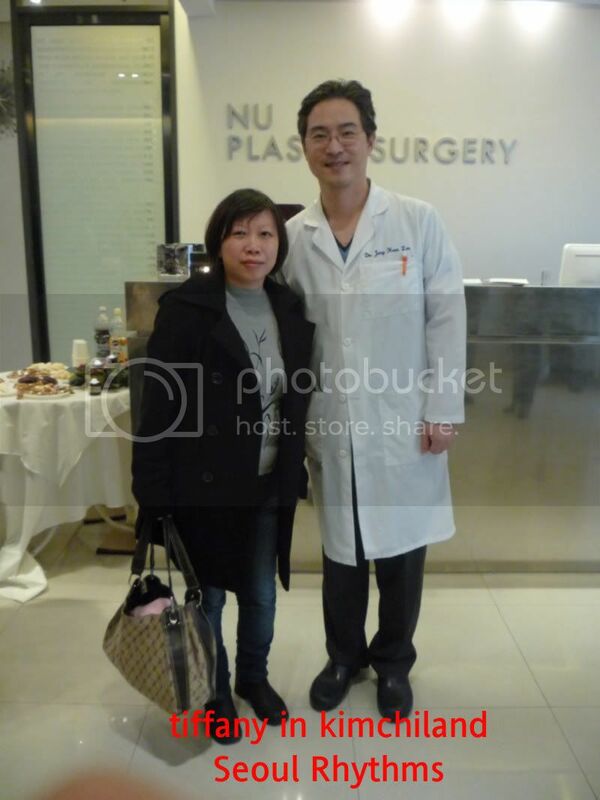 The director of Nu Plastic Sugery. And after this exciting segment, we were off to tamer pleasure. Lotte World has the world's largest indoor theme park. 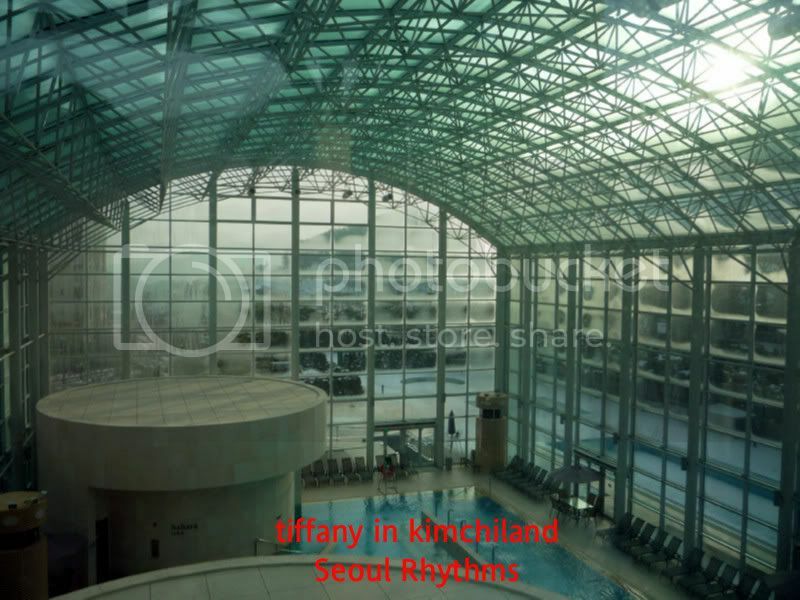 It has an outdoor section too but I think most people try the indoor theme park. I have yet to check out the outdoor section depiste having been there about 3 times. 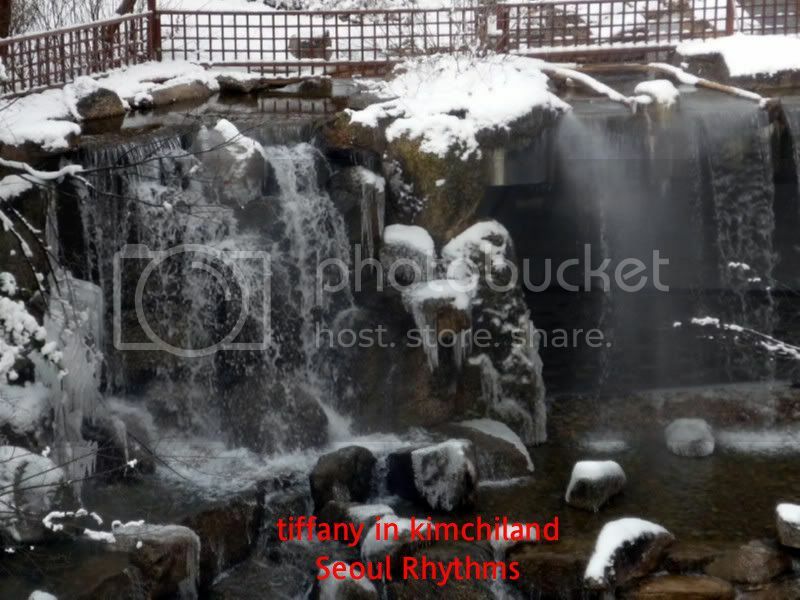 Just as Nami Island is best remembered for 'Winter Sonata', Lotte World is best remembered for 'Stairways to Heaven'. We were there on a Friday afternoon and the place was packed. So I think be prepared to wait a little for rides if you intend to go there during winter. Then again, you will not be subject to the elements of nature unlike a outdoor theme park. Take a ride on their monorail and get an overview of the whole place. 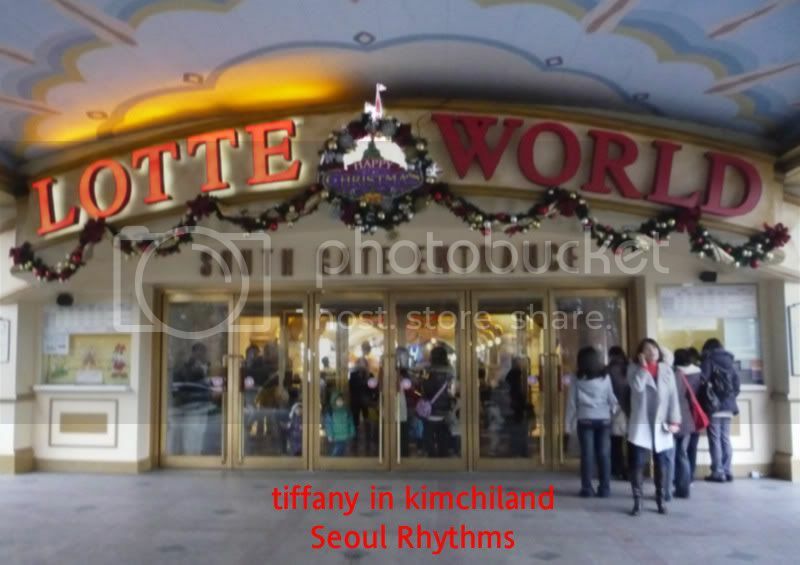 Now the best part of Lotte World? They have a big shopping mall and a huge department store and supermarket to boot. So I went off shopping. hehe! They were having winter sale!!! Argghhh! So many things to look at, so little time. And people, if you ever have the time, do check out the supermarket. I took a quick pick. There was a counter with a variety freshly-made kimchi plus some other food stuff I would have loved to examine further. 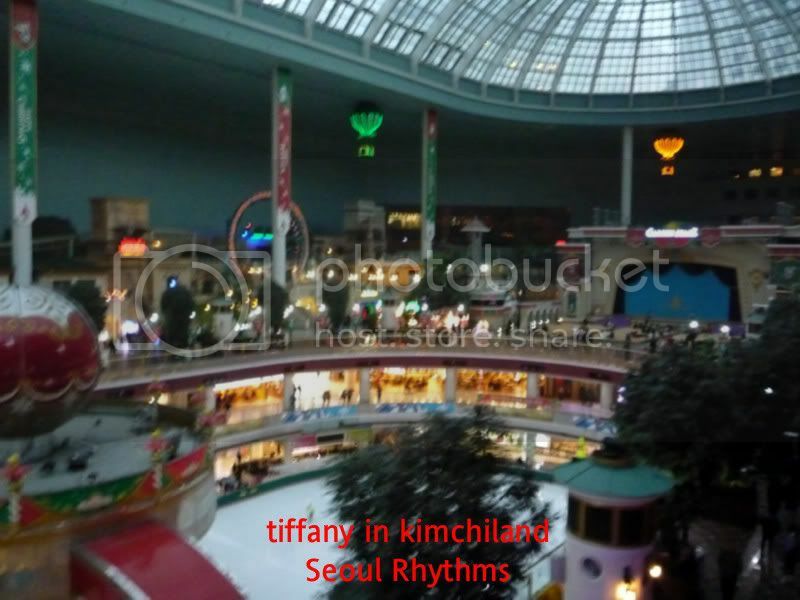 If you don't have the time to go all the way down to Jamsil for Lotte World and you can also check out the Lotte Department Store in downtown Seoul. No amusement park but it offers 12 floors of pure shopping. After so many days of good food, to be frank, all of us were feeling like little stuffed piggies But they had saved the best for last. Jin jin bara serves hansik/ 한식, which is traditional Korean fare. 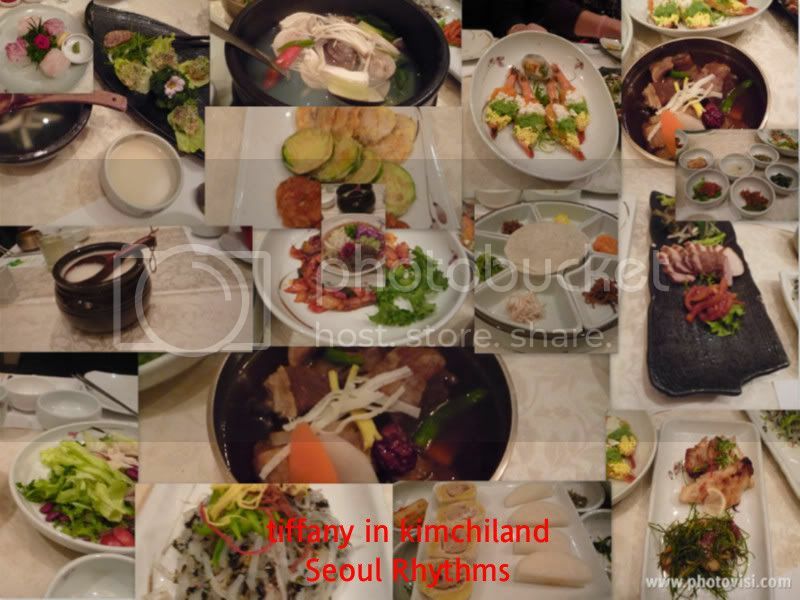 Real traditional Korean fare consists of many , many side dishes and just one main dish- rice. The portions are not huge as there were not meant to be filling. But hor...after about the 14th dish, I pretty much give up liao. 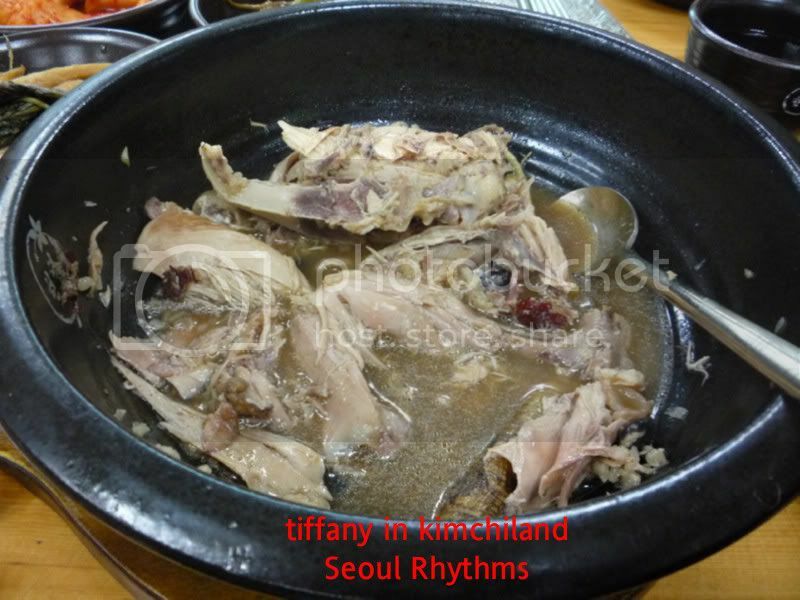 At the last count, there were at least 20 dishes, including the main dish of rice and deseert. Please go with a very, very empty stomach. And definitely with a group of friends. This should not be attempted alone. The hotel we were staying for the night was Hotel Courtyard Marriott, a fairly new hotel and part of the new landmark that conists of 2 huge shopping malls- Times Square and Shinsegae. 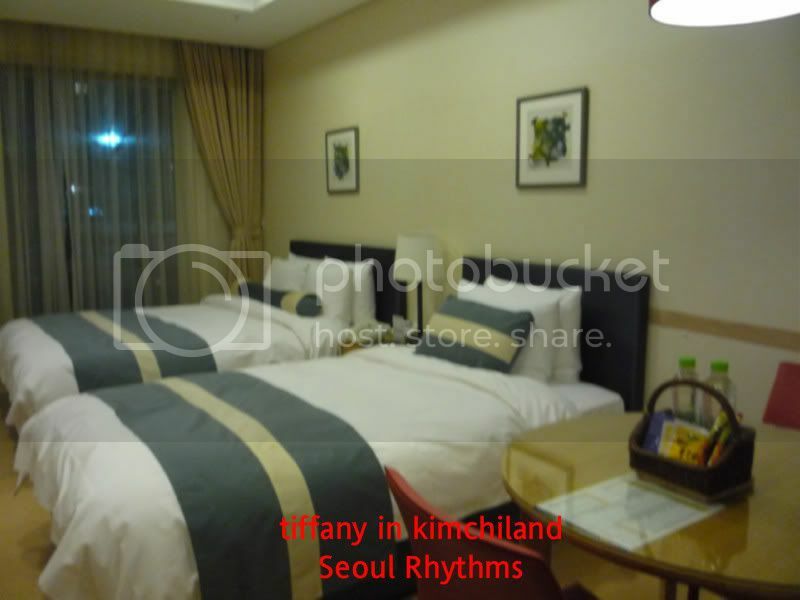 It is also the nearest hotel to the airport and minutes away from the nearest subway station. Pretty conveninient if you don't are there for an overnigher and don't really want to stay at the airport hotels. However, do not attempt to travel across the han river via car on a Friday night coz the traffic jam is horrendous. It took us over an hour just to get there. Can't comment much about the hotel except it seemed nice enough. You can't go much wrong with the Marriott brand. I would have like a little more time to check out the shopping malls. I think there's a Kyobo bookshop in one of the mall. Mr Jang Hyuk is set to sweep into Singapore on Monday, 17th January. This will be his second time here. 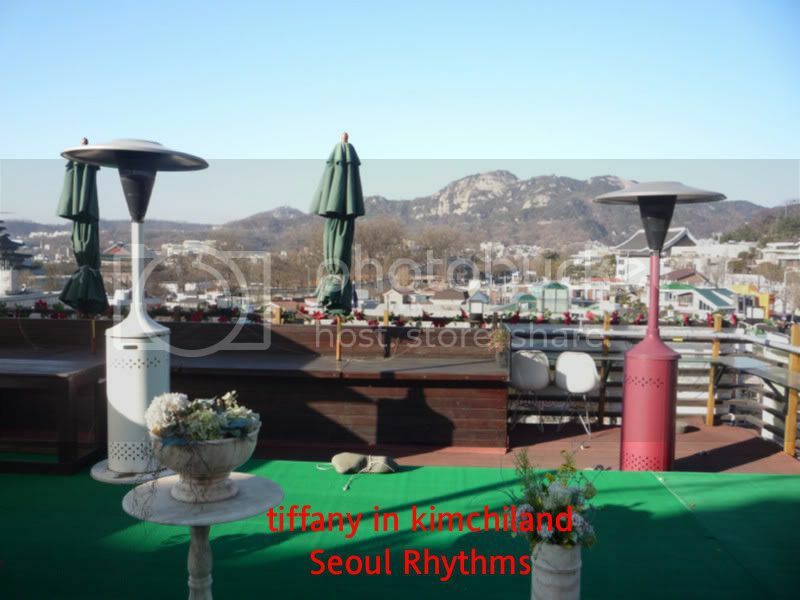 He was last here in 2007 for the filming of 'Dance of the Dragon'. No,no, he is not filming any movie here this time. He will however, be talking about his latest drama- 'Midas', which is scheduled to air in Korea on 21st February, SBS. It is a drama about M&A, about shady deals, about the corporate world, about love, about morals etc. What's strange is that he is actually here to promote a drama that is not even on air yet. SPE Networks (Sony Entertainment Pictures) will be launching a brand new channel in Singapore very, very, very soon. Can't write more at the moment as there is no official press release yet. BIG HINT: it is Korean related. Of course. So are the above 2 related, let's wait and see. Hang on toght to this site, I'll be back next week for more news on this very special event.